So I finished the first of my 5 Books for January. 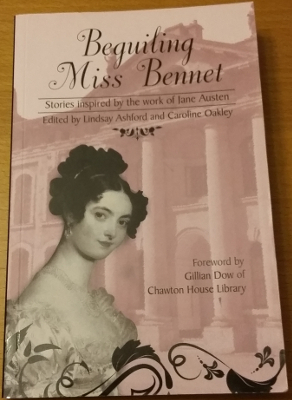 Beguiling Miss Bennet is collection of Austen-inspired short stories published by Honno Press. I added it to my Amazon wishlist after being impressed by Honno’s attitude and values when I attended their 30th birthday shindig back in September. But that’s really just me waffling, and avoiding the crux of the reason why I hadn’t already read this book immediately upon opening… It’s all to do with another Austen-themed anthology, A Certain Persuasion, published by Manifold Press in November, and containing several excellent tales of LGBTQ+ characters – including one written by me (which I’m not claiming is excellent in itself, but it at least sits in excellent company in that anthology). To cut a long story short, I absolutely loved the stories in ACP (my own excluded, I’ve not quite gathered the nerve to read it yet for fear of seeing a glaring error) to the extent that they have become what we used to term in fandom “head-canon”, and I was a little nervous lest this anthology ‘straightened out’ all that wonderful extra world. Anyhow, I’m happy to report that not only did this book not infringe upon said head-canon, it actually added extra depth to it. There are a lot of stories in this volume – far more than I expected, so I think there must have been a fairly strict word count limit for submissions. Some of the stories I didn’t quite ‘get’, but with so many I’m sure there’s a flavour for everyone. There’s stories which link the worlds of Austen’s stories to each other (Candour), to other stories widely known in Western society (The Nemesis of Meryton), and to alternate versions of the stories themselves (The Grey Lady, Mary’s Silver Knife). Forgotten Things and The Telltale Signs grabbed my attention and pulled me into worlds which I wanted to know more of, while My Name is Katherine Burrows and Farewell Lady Catherine provide insights to one of Austen’s key secondary characters; and I enjoyed the stories featuring Mary Bennet from Pride & Prejudice as I have rather wondered what might have happened to her. It was also good to see that Honno aren’t afraid to publish stories addressing the darker side of human society: both Mary Crawford’s Last Letter and Gorgeous George remind us that women’s lives, in any age, don’t always revolve around finding a partner and contracting a marriage. All in all, a splendid volume, highly recommended, with far more to it than this short precis of my thoughts.